Posing as an employee of the popular blogger, Linda Ikeji, with an identity card bearing the name Michael Mordi, the suspect was arrested and paraded last week for robbing unsuspicious members of public of their belongings at public events. 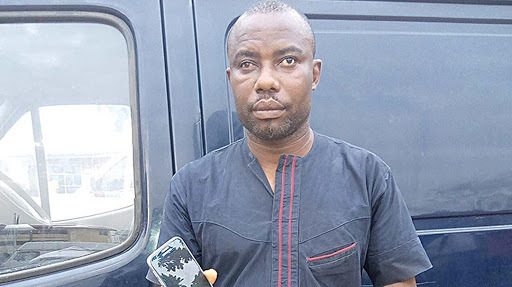 The suspect, who walked into one of the new generation bank’s head-office at Victoria Island, Lagos, for an event on March, 30, smartly made away with a Samsung Galaxy S6 phone and other items belonging to guests at the event. The suspect, Augustine Joseph said: “I have been into this business of stealing people’s things at event for more than a year now. I steal phones, laptops and other gadgets when attending functions. The method I mostly use is to come in as early as possible to familiarise myself with people. I always sit close to charging points where I would be able to carry out my act and I move around with different chargers to lend to people who need to charge their phones. To get details about upcoming events, I download some events app on my phone and I add Facebook pages of events so as to stay current on activities happening around me. I go to the extent of paying as a participant to attend trainings and workshop in order for me to rob people of their belongings.